The attempts by Dr. Ephraim Goodweather, Abraham Setrakian and their various allies to stop the vampires from spreading across New York City have failed, and the city is now falling into darkness. The plans of the evil 'Master' and his pawn Eldritch Palmer are becoming clearer, spelling doom not just for humanity but for those vampire clans opposed to the Master's will. With little choice, Setrakian forges an alliance of convenience with his ancient enemies to bring down their mutual foe. The Fall is the sequel to last year's well-received The Strain and the middle volume of a trilogy (the finale, Eternal Night, is due late next year). 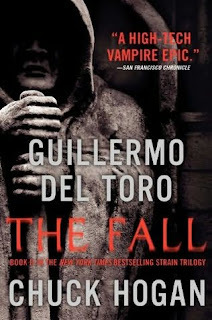 Conceived and developed for television by Guillermo del Toro (the director of Pan's Labyrinth and the Hellboy series) before he decided to retask it is a literary project, the book mixes his trademark action sequences and visual imagery with co-writer Chuck Hogan's thriller sensibilities, resulting in another tight and fast-moving novel. 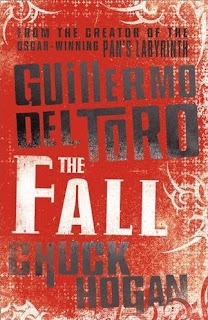 This is not high literature, but The Fall remains a well-paced and action-packed read. This is much more of an undemanding airport novel than say Justin Cronin's more weighty The Passage, but there are some nice horror flourishes in the book, most notably the twisted relationship between the newly-turned vampires and their 'Dear Ones', their loved ones in life whom they are driven to turn above all others. There are other, deeper moments of characterisation (particularly revelations about Setrakian's history) but this is a book more about the action than deep and meaningful characters and themes. It succeeds in its aims, but as such risks being a fun but forgettable book, particularly when the corn starts kicking in (the feuding criminal gangs of NYC joining forces to become elite vampire-killers is ridiculous but also fun to read). There is a strong cliffhanger ending, however, where the stakes and scale of the story are ramped up to new and more impressive levels. The Fall (***½) lacks the growing sense of horror of the first volume in the trilogy, with much more emphasis on action. It's a fast-moving story, but I can't help feeling that del Toro would have made much more of this story if he was in Pan's Labyrinth mode rather than Hellboy. As such it's fun, but lacks depth. The novel is available now in the UK and USA.